The Vivitar 500mm f/8 Mirror Lens is an incredibly compact and lightweight ultra telephoto. Using an advanced reflex design, our lens is a fraction of the size and weight of a traditional 500mm. Defocused areas behind the subject give smooth highlights, forming immediately recognizable rings that photographers prize. The Super Spectra Coatings assure virtually flare free photographs even under adverse lighting conditions. 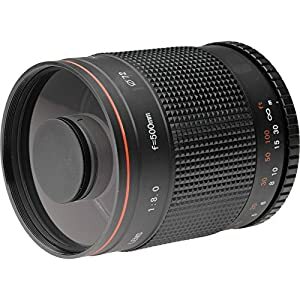 A simple T-mount adapter makes this lens work with both film and digital SLR cameras. Vivitar 500mm Mirror Lens (V-500MR), Sakar International, Inc. I just got this lens and I’m not quite sure what to even do with it. I tested it using a Nikon D3200 at 1/4000th on a tripod released by timer and to be honest the images from this lens are the equivalent sharpness of my 18-55mm Nikon lens hand held and cropped in to the same size. My 55-300mm Nikon lens out-performs this by far even when hand held. The aperture on this lens is fixed at F8, so the depth of field and focus can’t be improved by increasing it. The quality seems good, but the performance just isn’t there. Terrible performance, the fact that the aperture is fixed, all my photos came out dark. The manual focusing always resulted in blurry photos. I do not recommend this lens for my camera–Nikon D40. I guess I got what I paid for, less than a hundred dollars for a zoom lens is not a bargain. 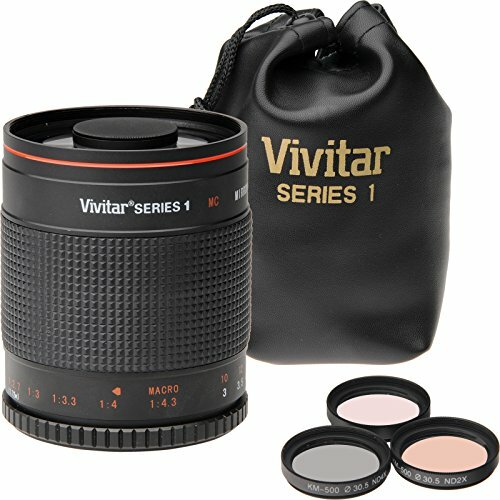 I have been using Vivitar Lens for over 30yrs but I’m not happy with this one. This prime makes you work for the shot. The bokeh is crazy and depth of field is very narrow.Perfect for dreamy, ethereal work made from afar. Minimum focal distance is about 6’….